PICK MODULES LIFO/FIFO Pallets,Cartons, Pieces multi-level work platform system that allows product to flow through a distribution center. CARTON FLOW FIFO Cartons, Pieces Uses small wheels or conveyor lanes to move cartons through the pallet rack to a picking position powered by gravity. RHINOTRAC LIFO/Cartons Heavy-duty carton flow roller conveyor with integrated brackets to lay into pallet rack for carton flow. DRIVE-IN LIFO Pallets, Store pallets on rails running the depth of the rack system with a common load and retrieval aisle. RHINODECK LIFO/Cartons Sturdy carton flow roller conveyor which will fit into all manufacturers’ carton flow systems. DRIVE-THRU FIFO Pallets Store pallets on rails running the depth of the rack system with separate load and retrieval aisles. CANTILEVER Rugged Cantilever rack is manufactured to handle the toughest storage applications of elongated materials from steel bars to wood planks, economically and efficiently. STRUCTURAL Uprights constructed from structural steel have a thicker wall than roll-formed posts and more steel at the corners to help absorb impact. RETAIL Pallet rack and specially designed accessories can store pallets, case products or awkward piece-parts in warehouse-style stores and Home Centers. RACK REPAIR Field repair solutions that are installed on standing pallet rack that has been damaged by forklift abuse. MEZZANINES Steel Mezzanines are custom engineered and manufactured to quickly add floor space without a costly building expansion or operational disruptions. AS/RS – Automated Storage & RetrievalAutomated storage and retrieval systems (AS/RS) are computer controlled systems with extreme accuracy operating in very narrow aisles. From standard selective pallet racking to complex pick modules, UNARCO offers customers over sixty years of engineered distribution center and warehouse storage design.Far beyond pallet rack and simple shelving, UNARCO offers the most extensive array of warehouse storage options in the material handling industry. Gravity flow options including carton flow, pallet flow, push back rack as well as static storage options including drive-in rack, cantilever and selective pallet rack are offered through the UNARCO distributor network. UNARCO has structured its Customer Service and manufacturing facilities to LISTEN to the customer’s warehouse needs and respond to simple requests such as custom paint colors, higher capacity tubular designed upright frames, and special abuse-resistant designs engineered to ensure warehouse safety. Pallet rack and warehouse storage solutions are available in bolted rack, interchangeable rack and structural rack to combine with in-house manufactured gravity flow options so your order ships from one pallet racking manufacturer. UNARCO works with consultants and engineers all over the U.S. to integrate our pallet rack with complex warehouse storage order picking software and support miles of warehouse conveyor. Pallet rack manufacturing facilities in Tennessee, Texas and Ohio cover the entire U.S. for close proximity to your distrubution center or warehouse project. No other pallet rack company manufactures heavy-duty roller carton flow conveyor which can ship with the pallet racking to help ease storage and coordination worries. RhinoTrac full-width carton flow and RhinoDeck are the sturdiest carton flow storage solution available and reduces maintenance costs and provides the flexibility to easily reconfigure as needs change. 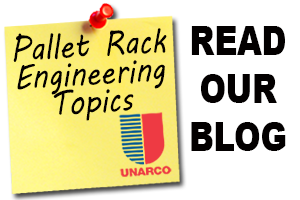 You will find no pallet racking storage manufacturer with a more complete warehouse storage offering or more project engineering experience than UNARCO anywhere in the material handling industry.